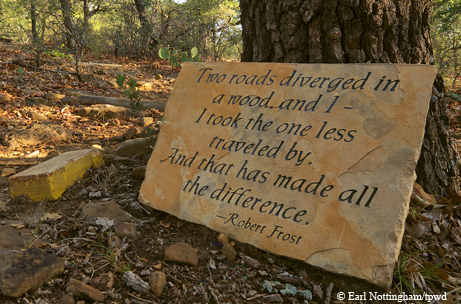 Museums, wineries and abundant nature-watching make Brownwood a destination for every taste. For a number of years, my family passed through Brownwood every few months on trips from Austin to Lubbock to visit relatives. We gener­ally timed it to have lunch at Underwood’s Cafeteria, which serves barbecue, all the sides and deservedly famous rolls. The kids called it Underwear’s, based on a misreading of the enormous sign out front when they were younger. About six years ago, while researching a guidebook on hiking in Central Texas, I discovered Lake Brownwood State Park, home of some nice trails and, in my humble opinion, the state’s coolest cabins. These experiences, and the fact that my mother had been born in nearby Rising Star, represented the extent of my knowledge of this area. I decided it was time that changed. I grabbed my 23-year-old daughter, Holley, a fellow outdoor enthusiast and fan of wine and food, and headed out for three days in Brownwood. Located near the geographic center of the state on Pecan Bayou, which feeds the Colorado River, the town became a county seat in 1857, a railroad stop in 1885 and, by 1910, a junction of the Gulf, Colorado and Santa Fe and Frisco railroads, all of which kept it bustling for decades. Camp Bowie, just outside of town, served as a World War II training camp from 1940 to 1946, with eight divisions passing through and as many as 30,000 men on site at any one time, including German prisoners of war. In more recent years, the town and surrounding Hill Country have attracted hunters, fishing enthusiasts and those seeking a respite from the big city, including my daughter and me. Our visit, most fortunately, fell on the second Friday of the month, when Brennan Vineyards in Comanche hosts a dinner (reservations required). Nearly 60 people from near and far, many of them dressed to the nines, gathered in Brennan’s limestone production facility to sample the winery’s signature product, a Viognier, and then strolled through a row of lighted trees to the Austin House next door. Dinner featured black-eyed pea bisque, beef tenderloin or herb-crusted fish, hominy mash and sauteed squash, and a winter fruit tart — served with three wines. The food was excellent, the company even better. Our table mates were well-read, well-traveled and generally charming. A White House state dinner couldn’t have topped it. Open for six years, the winery began with the purchase of the historic McCrary house as a weekend home for owner Pat Brennan’s Fort Worth-based family. The structure now serves as a tasting room, open Wednesday through Sunday, with complimentary tastings on weekends. Our home for the trip, Star of Texas Bed and Breakfast, sits among wooded, rolling hills a few miles north of Brownwood proper. We chose the Oak Cottage, a spacious room with a covered porch facing the trees and just a few steps from a one-mile nature trail. We enjoyed the view over breakfast, delivered to our room at 9 a.m., and then went out to walk the trail. Two miniature donkeys greeted us, and we saw lots of birds and wildlife tracks along the winding route, which is sprinkled with unusual artistic creations such as bottle trees, mosaics, wind chimes and carvings. Tempted to linger all day, we managed to head into town to check out the sights. The Brown County Museum of History downtown occupies a former county jail, built in 1902 of 18-inch thick limestone blocks to resemble a castle, the better to intimidate lawbreakers. The ground floor, originally home of the jailer’s family, now holds exhibits, including the Firearms Museum of Texas, with everything from tiny pistols to giant bazookas on view. We stuck our heads inside original jail cells on the second floor, which made us all the more appreciative of our cushy digs at the B&B and law-abiding lifestyle. 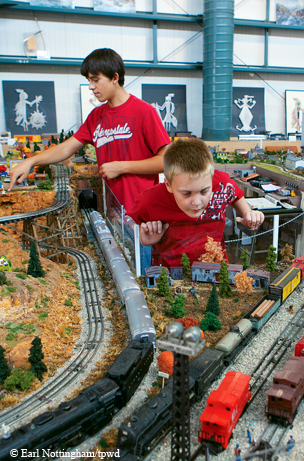 The nearby Martin & Frances Lehnis Railroad Museum, housed in a former granary, displays railroad history, including sets of passenger train china, and an extensive model railroad collection. We tried our hands at running a few of the model trains, and marveled at the attention to detail, such as mock waterfalls and tiny livestock. An actual Santa Fe caboose and business car outside can be toured with a guide, and a platform in back overlooks still-active train tracks. It seemed appropriate to grab a burger and milkshake for lunch at the nearby Runaway Train Cafe in — you guessed it — a restored train car. We then drove north on U.S. Highway 183, through Rising Star’s main intersection (no light, just a stop sign) and a few miles farther to Rising Star Vineyards, on County Road 290. The vineyards here are 22 years old, said owner Michael Oubre, who grows his own chardonnay, merlot and cabernet grapes and sells most of what he produces right here at the winery, a good reason to make the short trip. A picnic area overlooks the vineyards, and the shop carries cheese, crackers and sausages for those who forget to pack something. We had dinner back in town at the aptly named Turtle Restaurant, which celebrates slow, fresh food for lunch and dinner Tuesday through Saturday. While it isn’t always easy, owner Mary Stanley designs the ever-changing menu around local items as much as possible, including many ingredients from nearby Windy Hill Farm, where Ty Wolosin tends two organic gardens, chicken coops, goats and cattle. Stanley searched for postage stamps from around the world featuring images of turtles, and had them enlarged on canvas to grace the restaurant’s walls. The only thing that could have made our meal more perfect would have been to enjoy it on the outdoor patio (a nip in the air kept us inside). The restaurant has a delectable selection of desserts, not to mention its own gelateria, where Stanley herself whips up fresh, regionally inspired flavors, even using local wine occasionally. On Sunday morning, we walked the B&B’s nature trail again, then said goodbye to the donkeys and drove a few miles farther out on Texas Highway 279 to Lake Brownwood State Park for some real hiking. We started on the three-quarter-mile Texas Oak Trail, which traverses an upland area of oak-shaded grassland before descending through layered, wildly broken limestone boulders to trace the lakeshore. Prickly pear, Christmas cactus, lace cactus, Mexican buckeye, hawthorn, hackberry and many more native plants make the route interesting. We also saw cardinals, finches, vultures, wild turkeys and, on the water, herons and waterfowl. Numbered posts on the trail correspond to plant identifications in a guide available, along with a map, at the park entrance. We continued on a 1.25-mile trail along the lake to a fishing pier, then followed a slightly higher route back that reconnected with the Texas Oak, which returned us to the parking area. The park has 20 cabins and lodges and a group hall for meetings, all built by the Civilian Conservation Corps in the 1930s from local timber and stone quarried nearby. One of President Franklin Roosevelt’s New Deal programs, the CCC put young men to work across the country. Texas outdoor lovers greatly benefited from their efforts, which include roads, hiking trails, picnic shelters, cabins and even swimming pools in dozens of state parks, nearly all of them still in use today. During World War II, soldiers stationed at nearby Camp Bowie came to the lakeside park for R&R. The cabins got makeovers in 1978 and have air conditioning and modern appliances, but otherwise remain much as they were when built. Screened shelters and tent and RV camping are also available. Fishing piers, two volleyball courts, a softball field, picnic areas and more trails make this park a great place to spend a day or an entire weekend, which my family has done several times. Back in town, we stopped for lunch at good old Underwood’s, where the rolls haven’t changed, thank goodness. So we ordered a dozen to go, and took a little piece of Brownwood home along with our memories.